southern orders : THE UNENDING CONTROVERSIES AND AMBIGUITIES AND SCRATCHING OF ONE'S HEAD, WILL IT END IN MY LIFETIME? THE UNENDING CONTROVERSIES AND AMBIGUITIES AND SCRATCHING OF ONE'S HEAD, WILL IT END IN MY LIFETIME? I don't know who will react more negatively to this? Rank and file Catholics? Rank and File Muslims? or Radical Muslims who will react in the most horrible way possible? 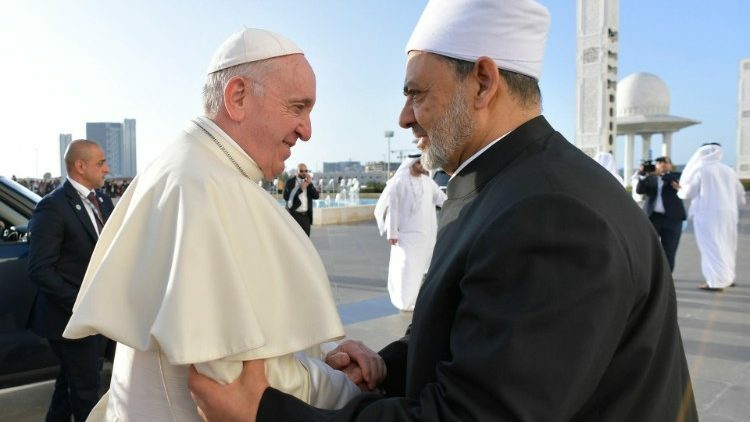 Pope Francis and the Grand Imam of Al-Azhar, Ahamad al-Tayyib, signed a document on “Fratellanza Umana per la Pace Mondiale e la convivenza comune… Human Fraternity for world peace and living together”. Do you get that? “The pluralism and diversity of religions” is “willed by God”. Obviously it is the Muslims that present the clearest threat the religious liberty and who are more radical about "false religions" than any Catholic today is. So if there is any good out of this, the good is moving Muslims to more tolerance in their own societies or societies they will conquer. Is it just me or does this sound like Freemasonry? Islam encourages deception and lying to infidels. But I especially love how Francis signed something saying that God WANTS multi-faiths. So I'm guessing that all this "announcing the good news" and making "disciples of all nations" was just a time-waster. This is pure nonsense. There is no "right to freedom" in Holy Scripture as we understand the concept a la the Enlightenment and 19th century political philosophy. Nowhere in Scripture does it talk about God willing diversity or diverse religions. In fact, the ancient Israelites did not have a very positive view of other religions, being as how they slaughtered as many of them as they could when they entered the Promised Land. Elijah wasn't too cool with them, either. Israel was a closed and exclusive nation and race....still are, as Christianity is exclusive of other beliefs but open to converts. This BS modern PC inclusivism is not only stupid, it is not natural and it is not healthy for Western culture. We need to be a lot more exclusive than we are...forget about these whiney, bed-wetting poor thing libs who "just love everybody." This kind of thinking would have gotten one excommunicated at one time. Now nothing does. There goes that religious freedom again that America gave to the Council. I guess it does not matter which religion one has, they are all the same, part of that diversity of religions willed by God. No wonder the SSPX considers that heretical; that is, because it probably is. At least ex-Catholics know that God wills all these different religions they can now choose. No those bed-wetting libs hate anyone with a different point of view as evidenced by the suppression of free-speech on most US college campuses today. It's all for show. Yes, Anon 11:12, it does indeed sound like Freemasonry. Can we assume that everyone commenting here has read the entire document and not just the passage quoted in the main post? And that everyone has read Father Z’s apologia with respect to that passage? A2, I read it. Could you please explain to me how Francis, with this document, and comments such as "proselytism is solemn nonsense," is in ANY WAY representative of ANYTHING that the Catholic Church specifically, or even Christianity in general, views its role and identity in human salvation. Please. I'm really open to "adult discussion" unlike that rigid TJM. Actually, let me extend my invitation. Can ANYONE explain? Have you read the New York and Virginia infanticide bills in their entirety? I am rigid? LOL. I am orthodox which does offend certain types of Catholics. But Jesus would offend them too. They appear to be offended by His command that it would be better that a person who harmed a child be at the bottom of the sea with a millstone around their neck. I responded by asking you to direct us to instances that justified this assertion. And I added that if you could not do so (and I was sure that you could not), would you please retract this calumny. It seems to me that such an attitude towards me as you expressed in the above assertion is likely to impede having the “adult conversation” you seek. And readers will notice that TJM posts yet another non sequitur comment designed to distract from the topic under discussion. A2, you are evading. I am bringing up a fabulous discussion topic on this Catholic blog. Saints and Fathers of the Church have made many references to Islam. There have been many rumors of communist and masonic infiltration of the Church which under Francis seem to be filfulled. Christ never claimed His Father "willed" many "ways" or "truths." The Church never denied Her role and identity before. Even VII theologians threw in the "baptism of desire" idea which in some respects at least implied a kind of "invisible" membership in the Church. Now in response to your specific desire to have me "prove" my claims, let me just state that for me - anyone who is defending the Democratic party agenda, and/or the politicians, is defending those who hate the Church. Now discuss please. ANYONE? Fathers? A2, how about this? I'll gladly retract my "calumny." Now please discuss. Also, Fathers? I need a priests view of this. Inquiring minds wish to know: "are all religions willed by God - Santeria, Satanism, Wicca, Protestant sects that claim the pope is the anti-Christ?" Or has Islam become such a force in the world our pope just has to bow and scrape before them? And if all religions were willed by God, including the preChristian ones, was there any real need for Christianity? I don't get it, but I'm not as enlightened as some of the other Catholics. By the way Fathers and experts, I was considering sharing (not proselytizing though, no way) the gospel later on today but now I'm worried that I might be thwarting God's will. Was Judaism, a "pre-Christian" religion, willed by God? Of course. That Judaism (and other pre-Christian religions) were willed by God does not preclude a need for Christ and Christianity. Dominus Iesus makes clear the perennial teaching of the Church that any religion that leads one to God draws its essence from Christ through the Catholic Church. God is not limited by our parochial small-mindedness. God has worked and does work, and will work in ways that confound us, distress us, and monumentally upset our Apple carts. One can lament this, one can decry this, one can try to restrict God's plan. All one will accomplish in that is getting in the way of the Almighty. Not a good plan. You're correct TJM, however because we know Francis will not be clarifying anything, I am hoping that some priests will. Given that Christ and His Church claimed a rather important role in salvation history, and has always sent out Christians to the "peripheries" to bring the gospel, why would Francis sign a document which "cuts the head off" of any reason for the Church to exist, or function? Get it? "Cuts the head off..."
I'd chuckle if I wasn't crying because of Francis and his monster Church. Thank you for retracting your calumny. Contrary to TJM’s continual rantings, I do not “support the Abortion Party.” I do support obtaining facts, trying to understand complex situations, and seeking wise solutions on the basis of those facts and that understanding. This includes trying to obtain facts and trying to understand the complexities regarding our political parties. TJM does not seem interested in these things. That is the root cause of the differences we have on this Blog. And this was also the spirit in which I made my comment about reading the entire document under discussion here as well as Father Z’s apologia regarding the specific passage quoted in the main post. Along similar lines, Anonymous’ post at 10:02 a.m. addresses your objections regarding the “diversity and pluralism” of religions quite well. And if you really do want to explore all this more deeply and seriously, please read Rabbi Sacks’ book for which I provided a link and then let’s talk again. My "rantings" are consistent with our Lord's admonition that it is better that a person who would harm children be at the bottom of the sea with a millstone around his neck. I know you know better than Our Lord. Obviously, I have struck a nerve because you are continuing to attack logic and truth. Any Catholic who votes for Democrats is voting to support abortion, as evidenced by Cuomo's and Northam's infanticide bills, end of discussion, unless you are prepared to abjure their evil and leave the Party of Moloch. Actually, our genial host, Father McDonald has suggested that it is past time for the Church to forbid Catholics to vote for the Party of Moloch. Maybe you should complain to Father McDonald. "I am beginning to think that like Fascism, godless communism and other authoritarian governmental models, that Catholics must be told they can no longer belong to a political party that has become as evil as the Democrat Party." "That Judaism (and other pre-Christian religions) were willed by God does not preclude a need for Christ and Christianity." Can one really make a leap from saying that God's Chosen People in the Old Testament were willed by God to saying that other pre-Christian religions were equally willed by God? The Old Testament is full of stories of how God's people were formed out of the surrounding paganism and expected to follow God's holy will through his prophets by adhering to God in opposition to the idolatry of their neighbors. This is hardly a reflection of multiple religions willed by God. "One can lament this, one can decry this, one can try to restrict God's plan. All one will accomplish in that is getting in the way of the Almighty. Not a good plan." It is definitely not God's design or a result of his wisdom for there to be a diversity of religions. This is heresy and, frankly, apostasy, if one truly subscribes to it. And if you cut yourself off from this basic Christian understanding, you are the last person to tell anyone else about "the way of the Almighty." Contradicting the only historic Christian understanding of religion and God, while claiming to be a Christian, is epistemologically unsound since you have no way of knowing Christianity beyond what is popular at the moment. Not a good plan. "Can one really make a leap from saying that God's Chosen People in the Old Testament were willed by God to saying that other pre-Christian religions were equally willed by God?" I believe so, yes. Do you think otherwise? Why? If you say the other pre-Christian religions were NOT willed by God, why were they not? "It is definitely not God's design or a result of his wisdom for there to be a diversity of religions. This is heresy and, frankly, apostasy, if one truly subscribes to it." Yet, God willed the Jewish People into being. And God told them that his covenant with them was everlasting. Why were the Jews willed into being if their very existence is heresy and apostasy? There was no need for the Jews, it seems you are suggesting. Salvation would have come with NO intermediary covenant from God, no? "I believe so, yes. Do you think otherwise? Why?" As a Catholic Christian, I believe otherwise. Why does the Old Testament repeatedly condemn the paganism of the nations around ancient Israel if these other religions were equally willed by God? In fact, why have a chosen people at all, if God's will is reflected in a diversity of religious faith? In fact, such a divinely designed religious plurality should be reflected in the discourses of God's messengers, the prophets, (instead of condemnations of idolatry in Jeremiah 2:11, Hosea 10:8, and Amos 7:9) since any alternative would only create an exclusive vision of truth and "burden" the Jews and later, Christians, with a negative view of other religions. It is not hard to discern from where Christian doctrinal exclusivity derives - it is inherited from the Old Testament and its treatment of religion. By seeking to change this, you can claim no support in Holy Scripture or any of the Tradition of the Church. "If you say the other pre-Christian religions were NOT willed by God, why were they not?" Unless, God wills satanic worship, God could not will religions, who are characterized as worshiping devils (Psalm 95:5). Likewise, if God willed pre-Christian religions ("Gentiles," in Old Testament parlance), why would Holy Scripture state that even their meat would defile the children of Israel (Tobit 1:12)? Why would idolatry be considered a "crime," in 1 Samuel 15:23 if it could be part of God's will for others? If all of these condemnations were relative to only the children of Israel, why would Holy Scripture provide such a record of absolute condemnation of other religions? I am not free to disregard this scriptural record and must view it as a revelation of God's understanding, including on the issue of religious pluralism. You are equally bound to this understanding. "Yet, God willed the Jewish People into being. And God told them that his covenant with them was everlasting. Why were the Jews willed into being if their very existence is heresy and apostasy? There was no need for the Jews, it seems you are suggesting. Salvation would have come with NO intermediary covenant from God, no?" You are equating modern Judaism, which has rejected the one and only Messiah, and today cannot claim any salvific covenant with God, and pre-Christian Israel, which was the beginning of God's covenant people. The Jews of the Old Testament were God's people and the beginnings of the Church. This people and their religion are not the same as the physical descendants of Abraham, who have subsequent to their rejection of Christ, become characterized by an embrace of error and apostasy from their true God. While the status of the Jews remains as God's original people, the people of God is no longer identified with them (Eph, 2:11-15) and their rejection of the new covenant of Our Savior, leaves their religious rites as ineffectual for salvation (Hebrews 10:4-5). Our Savior taught no less when he affirmed that, "he who honoureth not the Son, honoureth not the Father, who hath sent him" (John 5:23). Likewise, Our Lord's apostles affirmed that no religion that claims to serve the Father, but rejects the Son, can be true, much less willed of God. St. John the Apostle wrote, that "whosoever denieth the Son, the same hath not the Father. He that confesseth the Son, hath the Father also" (1 John 2:23). Furthermore, the Church's historic teaching that modern Judaism, which claims theological continuity with their ancestors through physical descendance from Abraham, is insufficient to establish the truth of their religion is reflected by St. John the Baptist's words, "Bring forth therefore fruit worthy of penance. And think not to say within yourselves, We have Abraham for our father. For I tell you that God is able of these stones to raise up children to Abraham" (Matt. 3:8-9). In accordance with the teaching of St. Paul, the Church affirms that "all are not Israelites that are of Israel" (Romans 9:6). For this reason, in order to secure the obedience of faith of all the nations (Romans 1:5), Christ gave his apostles the Great Commission of teaching all nations the full truth of God (Matt. 28:20). According to your support of modern Judaism as being part of God's will, the Great Commission exempts the Jews, which is contradicted by Holy Scripture, no? Why would God will those religions which deny Him? Why would God give the First Commandment and "will" that which is incompatible? Why would Christ claim to be THE way and "will" religions claiming another way? Why would Christ and His Church send out disciples to convert and SAVE the world if God wills those other Faith's which His followers have been told to convert? Of course I'm not as enlightened as Francis and smart Catholics. Please explain. One last thing: this "pretzel logic" of "permissive will" vs the REAL "will will" - does anyone really believe that ANY member of ANY other faith will be reading this document in this way? Do you think that Francis and those theologians he checked the document with thought everyone would read it in this way? Or is it only uneasy Catholic who are using this logic? 2 Jn, 10-11: "If anyone comes to you and does not bring the doctrine of Jesus Christ, do not receive him into the house or give him any greeting, for him who greets him shares his wicked work." That is pretty clear to me. All the "pretzel logic," makes one wonder at which point can one verbally make a heretical statement, and can one even verbally apostatize from the Faith? Those who make a habit of infusing orthodox interpretations into plainly heretical statements, forget the fact that these original statements do not include such added stipulations and nuances. During the big debate over the death penalty change in August 2018, Ed Feser mentioned that any statement can be given an orthodox interpretation if one applies enough true theology to it. He cited the example of how the phrase "God does not exist" can be salvaged in interpretation if one interprets it to mean that God does not simply exist, but is the Subsist Being, itself. However, all of these attempts to spin heretical phrases is not only not Catholic but is also not even sane. If one has reached the point where verbal falsehood cannot be stated, he or she has violated common sense and should be ignored, both for the listener and the erroneous defender of such nonsense, sake. "Why would God will those religions which deny Him? Why would God give the First Commandment and "will" that which is incompatible? Why would Christ claim to be THE way and "will" religions claiming another way? Why would Christ and His Church send out disciples to convert and SAVE the world if God wills those other Faith's which His followers have been told to convert?" In anonymous's worldview, the truth is not exclusive, it is all a matter of degrees. Some religions are more or less true. Even Catholicism can hardly claim exclusive possession of truth since, by the development of doctrine, more of the Faith the Church possesses will become clearer to its faithful over time. This, in turn, necessitates great humility, tolerance, and openness to new and challenging statements and directions by church leaders. It also calls for intensive ecumenism and inter-religious dialogue since God is a mystery at which we all are grasping, some more or less inadequately. However, this worldview is hardly as old as anonymous, and he or she may even remember when its opposite was actively taught by the Catholic Church and her leaders and is clearly not taught in less progressive books like Holy Scripture (this is why we need biblical scholars to add modern meaning to the pre-modern text). Isn't this right, anonymous? *"Subsist Being" should read "Subsistent Being"
*"Some religions" should read "All religions"
"In anonymous's worldview, the truth is not exclusive, it is all a matter of degrees. Some religions are more or less true." This is not "my" worldview. In terms of revealed truth, it is the view (read: Teaching) of the Catholic Church. "The Catholic Church rejects nothing that is true and holy in these religions. She regards with sincere reverence those ways of conduct and of life, those precepts and teachings which, though differing in many aspects from the ones she holds and sets forth, nonetheless often reflect a ray of that Truth which enlightens all men. Yes, to varying degrees non-Christian religions "often reflect that ray of Truth which enlightens all men." But that does not lead me or the Church to dismiss other religions, even pre-Christians ones, of devoid of God's revealed Truth. "But that does not lead me or the Church to dismiss other religions, even pre-Christians ones, of devoid of God's revealed Truth." Again, you are making an unwarranted leap. Stating that other religions (pre- or concurrent with Christianity) have a measure of truth from God, who enlightens all those in darkness, is not the same as stating that false religions are willed by God. Rather, the Church proclaims that it is God's will that all men be saved "and come to the knowledge of the truth" (1 Tim. 2:4). This is a plan of salvation that certainly would not be expressed thus in God's holy Word if salvation and knowledge of saving truth were accessible in non-Christian religions. Your erroneous views on salvation being accessible in other religions that you believe may lead others to God may be why you and many modern churchmen prefer ecumenism and inter-religious dialogue to the extent that you are your dialogue partners are "ever learning, and never attaining to the knowledge of the truth" (2 Tim. 3:7). Return to proclaiming Christ and salvation in Him and His Mystical Body, alone. I don't see anything about God willing those parts that are NOT true and holy, much less even willing those parts that ARE true and holy. The future will judge Francis, and I don't think it will be kind. I would add that even though people in invisible ignorance may be saved outside the visible boundaries of the Catholic Church, they are not saved through their false religions, heresies, or schisms. Those who may be saved outside of membership in Christ's Mystical Body, the Catholic Church, are saved through some connection with Christ and His Church. Falsity does not save anyone. Christ through His Mystical Body, the Catholic Church, is what saves people.